If your camp offers home visits to prospective families throughout the year, you may schedule them in CampSite through the Home visit & Tour tab on the Family Profile page. To schedule a home visit with a family, click "+Schedule home visit..." within the Home visit & Tour tab of a Family Profile page. The home visit has been scheduled. 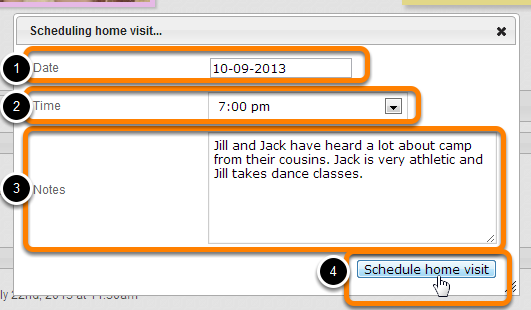 To view upcoming home visits, select "Home visits" from the Camper dropdown menu on the navigation bar. The next twenty home visits will be displayed, with the family name, date and time, location and notes. A home visit can be unscheduled by double-clicking the red minus sign in the appropriate row.